To turn its luck around, Nikon 7731.TO 0.00% needs to start breaking some mirrors. That’s not normally thought of as a way to good fortune, but mirrors—specifically, the ones that add bulk to its high-end single-lens-reflex cameras—are one of Nikon’s biggest problems right now. The digital camera market is in sharp decline as smartphones spread. Compact cameras have been hit hardest, but Nikon’s professional-grade cameras are also suffering. The market shows growth in just one category: “mirrorless” cameras. They are smaller and cheaper than DSLRs—which use mirrors to reflect images onto the camera’s sensor—but like them offer high image quality and the versatility of interchangeable lenses. For consumers, mirrorless models make for a good upgrade from a smartphone camera, without breaking the bank. In the first four months of this year, shipments of mirrorless cameras by Japanese companies were up 12% from a year earlier, according to the Camera and Imaging Products Association. 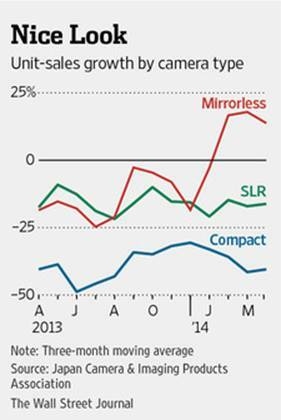 Measured by revenue, mirrorless sales globally were up 39%, likely due to a shift toward higher-end models. Over the same period, shipments were down 42% for compact cameras and 17% for DSLRs. Nikon was the last of major Japanese makers to release a mirrorless camera, and still offers only a handful of models. The company likely fears cannibalization of its high-end DSLRs, but its strategy seems not to be working. Nikon’s camera division, more than two-thirds of the company, posted a 9% revenue decline for the year through March. As a company that weathered the transition from film to digital, it should know better than to stand against the technological tide. Sony,6758.TO +0.23% Olympus and Panasonic 6752.TO +1.45% are leading in the new field. Nikon’s solution to its flagging stock price—down 35% over the past year—seems rash. Incoming chief executive Kazuo Ushida said the company plans to dive into medical equipment, in which it has no expertise, and has earmarked $2 billion to acquire companies in this space over the next three years. But Nikon may have missed the party. Several other Japanese companies, including Hitachi6501.TO +0.27% and Toshiba, 6502.TO +1.96% have expressed medical ambitions, while rival Olympus is already a global leader in medical imaging, as well as in mirrorless cameras. At 14 times forward earnings, in line with its average over the past four years, Nikon’s shares hardly seem a bargain. To revive its image among investors, the company needs to focus on making cameras that consumers actually want to buy.